Primatel are pleased to offer paper rolls for your till in high quality, A grade paper. Click on the links below to purchase the size you need. Express delivery available. Buy 4 boxes of 80 x 80 thermal till rolls and get one free. 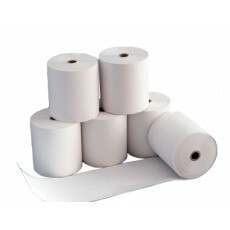 Plus free delivery..
Buy 4 boxes of 80 x 70 thermal till rolls and get one free. Plus free delivery..
Primatel are pleased to offer our 80mm x 80mm thermal rolls in high quality, A grade paper ..
For use in your Clover terminal 80mm width x 70mm diameter x 56m approx length Primate ar..
Primatel are pleased to offer our 80 x 60mm thermal rolls in high quality, A grade paper&n..